Afternoon session coverage by livetweeting from the event. Im archiving the tweets using CoverItLive! All sessions after lunch of day 2 #mosc2010 will be covered here except for wordpress related will be on next post. Watch the reply of the live blog! Talking about python, how powerful is python and also how to hide your text into files like images, mp3s,etc. The session Beyond Cloud Computing New Features Application, Abu Mansur Manaf, Cunsultant Persis, Malaysia which i dont quite understand the whole thing, he talked some about social media, cloud…. and im confused. Maybe i dont get it since is more business oriented. After that Beginning Smartphone Web Development – Bikesh, iTrain, Malaysia session is about HTML 5, which you can write apps for the mobile, skin it to iPhone like, which is super cool! Some very cool demo, easy to do and practical! 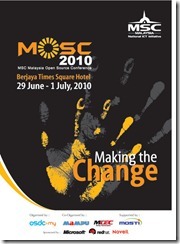 #MOSC2010 – Day 2 – WordPress Sessions!! !